A scrumptious scarf shawlette perfect for weekends! This quick squishy knit boasts pretty stripes and feminine lace! Worked on size 11 needles (or 1 size larger than your yarn calls for) it’ll be ready to wear before you know it! Pick 3 colors ( 1 skein each) - 2 for the stripes and a 3rd for the lace - will you be demure or run wild? The possibilities are endless! 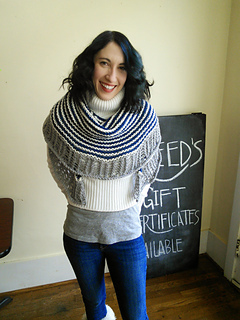 Worked in Berocco’s Vintage Chunky yarn you can afford to make one for everyone on your next holiday list!